Have you thought about redecorating using Wood and Iron Doors Houston? This style of door is becoming very popular in home design. The combination of materials makes it perfect for adding a rustic look to your home. There are hundreds of styles on the market. This variety makes it easy to choose one that you will love. Many companies also offer custom solutions as well. There is no reason not to incorporate these elements in your decor. Some homeowners might have a hard time thinking about how and where to use wrought iron doors in Houston. This style of door may seem quite dramatic. It can be hard to picture how to incorporate that type of element without it being too much. There are many areas throughout your home that would enjoy this type of face lift. If you have thought about upgrading your doors, take a look at the tips below. By keeping these tips in mind, you can bring a stunning new look to your home. Consumers looking for exterior and interior doors in Houston should call Southern Front first. Southern Front Stained Glass and Doors has a variety of wooden and iron doors for consumers to view. You can see their selection in store or online by visiting http://www.southernfront.com. They can help you find the right door for your home. Consumers can also contact them by calling 291-890-5860 to discuss custom models. Curb appeal matters, even when you are not selling your home. One way to upgrade your home’s exterior is to use wood, iron and fiberglass entry doors in Houston. These doors will make a big impression on anyone who sees them. Wood, iron, and glass doors look both rustic and sophisticated. They can bring elegant curb appeal to any home. Some people may be reluctant to install a door made with wood and iron alone. These doors can seem dark and imposing. They also shut out a lot of natural day light. As a result, they can make your home’s interior feel dull and muted. By opting for a door that includes fiberglass as well as wood and iron you can remove those risks. Fiberglass comes in a frosted or clear finishing, which is a huge perk to many people. This choice lets you decide how transparent your front door is to those who pass by. 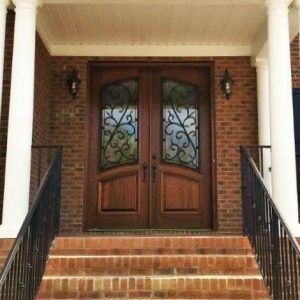 If you are considering a wood, iron and fiberglass door, contact Southern Front. Southern Front Stained Glass and Doors can offer you a wide selection of composite doors. You can view their products online at http://www.southernfront.com. If you do not find a style you like, speak with them about their custom solutions. Customers can call Southern Front at 291-890-5860. Using wood and iron in interior decorating is a bit more challenging. The best way to do this is to investigate custom interior doors in Houston as an option. Custom solutions will let you determine how much of each material the door uses. As a result, you can control the effect it has on the room. For example, in some spaces, you might not want elaborate iron flourishes. In others, something more decorative would look much better than something plain. Upgrading your interior doors can be a major project for many families. Be sure you choose the right doors by taking your time. This is not a decision that homeowners should rush. Avoid focusing on the price per door alone. Instead, examine the materials the door uses and the anticipated lifespan of the door. When it comes to wood type and color, let the size of the room guide your decision. Darker stains and heavy iron doors can make some rooms feel small and crowded. Southern Front has many wood and iron doors available to consumers across the U.S. and Canada. You can view their products online by visiting http://www.southernfront.com. Residents of Houston can visit them in store to see their line of products and speak with sales staff. You can also contact Southern Front by calling 291-890-5860. Some homeowners are thinking outside of the box when it comes to their interior doors in Houston. Incorporating wood and iron elements in double doors and larger areas is a rising trend. These touches bring rustic charm to any room. Dining and living areas in particular can look amazing with large wooden and iron doors. When closed, they can divide a big room into smaller, private areas. French doors, while traditional, do not allow for the same privacy. Depending on the size of your room, you may want to consider barn-style doors to divide the area. Barn-style doors will make any room look unique and vintage, and are perfect for larger homes. If you entertain often or host frequent family gatherings, consider barn-style doors. You can leave them open during meals and close them after, to allow children space to play. Southern Front has many unique wood and iron doors for customers to browse through. If you cannot find one you like, contact Southern Front to discuss custom options. Southern Front wants to be sure you are in love with your home. Finding the perfect doors is a great way to start. Take a look at their products online by visiting http://www.southernfront.com. Customers can also visit them in-store or contact them by calling 291-890-5860. Decorating with wood and wrought iron doors in Houston is not as hard as it seems. There are easy ways to incorporate those materials in almost any home’s decor. Exterior doors are the most popular choice, but homeowners should not ignore interior options. Wood and wrought iron can make any room look more vintage and cozy. When used right, they are sure to improve any living space. People interested in buying these types of doors should contact Southern Front first. Southern Front Stained Glass and Doors is happy to supply high quality interior and exterior doors. You can contact Southern Front by calling 291-890-5860. Their products are available online by visiting http://www.southernfront.com. They have pre-made and custom options available. If you are looking for wood and iron doors Houston, look no further than Southern Front.